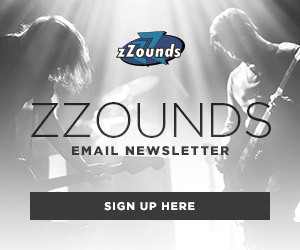 Team zZounds is back from this year’s NAMM show and everyone’s still buzzing about all the sick gear they saw. From signature stacks to a new PA that sounds unbelievable for its size, to a certain nu metal icon, here’s the gear (and people) they were most excited to see. I was extremely impressed when I got to step into the (somewhat) soundproof demo room at the Electro-Harmonix NAMM booth to check out the 95000 Looper. They aren’t kidding when they say it’s their “most advanced looper to date.” I think it might be anyone’s most advanced looper to date. This thing allows you to get super down and dirty with separate console-style faders for each of your six looping tracks, with one stereo mixdown track per loop. There might be a bit of a learning curve to integrating the 95000 into a live performance setup, but I think this looper is a very powerful tool for writing, rehearsal and studio use, especially thanks to its 44.1kHz audio and MIDI capabilities and built-in USB port. Like most people these days, I have a sweet spot for offset guitars, especially Jazzmasters and Jaguars. 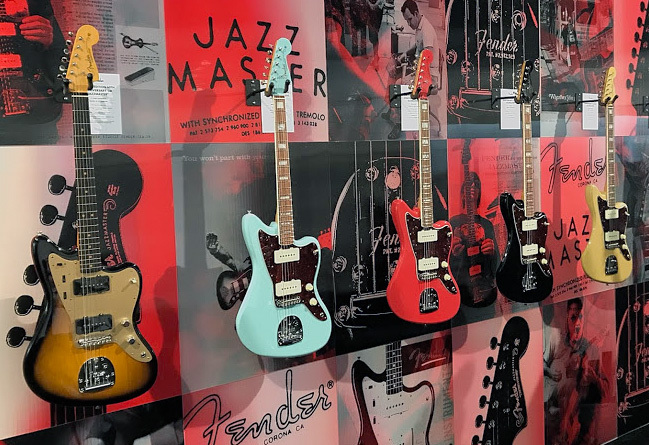 With 2018 being the 60th anniversary of the Jazzmaster, Fender celebrated by releasing a line of six commemorative guitars. Four out of the six models feature essentially the same configuration, but with some fresh new finishes including Daphne Blue, Black, Vintage Blonde and Fiesta Red — all with matching capped headstocks. My favorites of the series, though, are the ones that are even more different from the norm. The Triple Jazzmaster model features a trio of Tim Shaw-designed humbuckers with Filter’Tron covers, and the 2-Tone Sunburst model sports a mean look with an anodized gold pickguard, chrome knobs and black Jazzmaster pickups. With their radical, futuristic design and its status as the belle of the ball within the rock community, it’s hard to believe that the iconic Fender Jazzmaster was introduced almost exactly 60 years ago at the 1958 NAMM show. Offset curves and a distinct sound have transformed the Jazzmaster from what was to be a Jazz guitarist’s instrument, to a surf rock icon, and finally to the indie rocker’s axe of choice. Plug one of these babies through a fuzz pedal and you’ll experience a sonic onslaught that some might think isn’t meant for mere mortals. To celebrate the Jazzmaster’s diamond anniversary, Fender has created a few limited edition custom models that really show off what the guitar can do. The one that caught my eye was a beautiful, three-pickup model in what looks to be a Sonic Blue finish with a tortoise pickguard. Of course, the most immediate difference to be found on this guitar are the trio of unusual pickups. These Tim Shaw-designed humbuckers have been embellished with Filter’Tron covers for a truly unique look. I didn’t get the chance to plug on in at the show, but I know that’s the first thing I’ll do if we get one at the office. Of course, it’s a Fender, so I know it’ll sound fantastic. The new baby in the family of Bose portable PA systems has arrived! The Bose S1 Pro is an all-in-one PA system designed to cover audiences up to 50. Weighing only 15 pounds, the S1 Pro gives you two XLR-1/4″ inputs with individual reverb and 2-band EQ on each, plus selectable ToneMatch presets for your vocal mic and acoustic-electric guitar. The 3rd channel has a stereo 1/8″ input, plus a built-in Bluetooth receiver for streaming tracks from your phone, laptop or any Bluetooth device. Add the optional lithium-ion rechargeable S1 Pro Battery, and the Bose S1 Pro becomes a truly portable PA with no need for a power outlet. It’ll play at full power for up to 6 hours on a full charge. 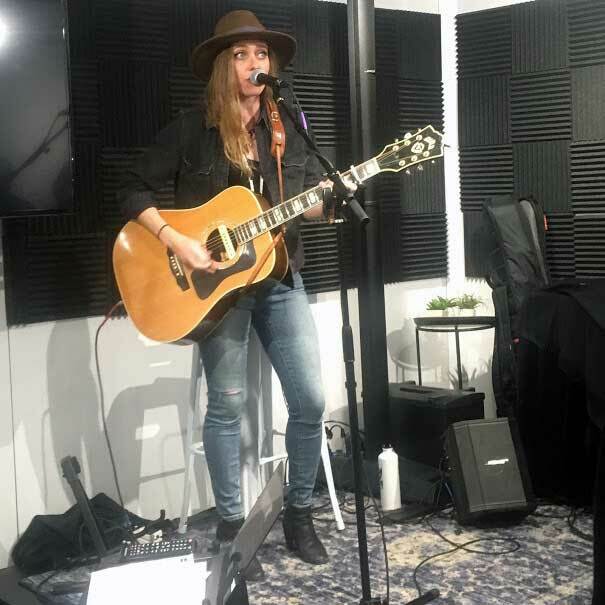 We got to hear singer-songwriter Megan Slankard demo the S1 Pro at Bose’s NAMM booth, and we’re here to report that this little guy is impressively loud for its size. The S1 Pro really fills the room, thanks to its large woofer and three high-frequency drivers strategically aimed to give you wide, even coverage. The built-in reverb and ToneMatch presets sounded great on Megan’s guitar and vocal, and she even used the S1’s stereo channel to play backing tracks through her phone. If you’re in the market for an all-in-one portable PA speaker, the Bose S1 Pro needs to go on your list. It sounds bigger and better than your typical small acoustic guitar amp or keyboard amp — and it’s a perfect fit for solo performers, backyard parties, and beyond. One of the most impressive things to come out of last year’s NAMM show was Laney’s introduction of the LA100BL, a painstakingly accurate reissue of Tony Iommi’s famed Supergroup head. This year, I think they topped themselves by offering this head in a 30W version. Everyone loves a 100W tube head, but let’s face it, the places where it’s appropriate to crank one of those are few and far between. While it’s still capable of being blisteringly loud, the LA30BL will hit that signature Sabbath tone much faster than its higher wattage sibling. It’s coming with a similar package option as the LA100BL as well, complete with a matching cab and Black Country Customs boost pedal, but this time the cab is an offset 212, which is the perfect companion for this head. Last year one of my top picks was Laney’s LA100BL, a reissue of the classic British amp that became the rig that launched 1,000 Sabbath-Worship ships. The 100-watt version was limited to just 50 worldwide and the handful we at zZounds did get, we pre-sold so fast it made our heads spin. Lyndon Laney built a 30-watt version but it never made it past the prototype phase, as back in the late ’60s and early ’70s a 30-watt amp was just too underpowered for what was needed — in fact, Laney even made a 200-watt version of the amp back in the day. Now low watt amps are committing regicide on their bigger brothers to usurp the throne as the King of Tone. 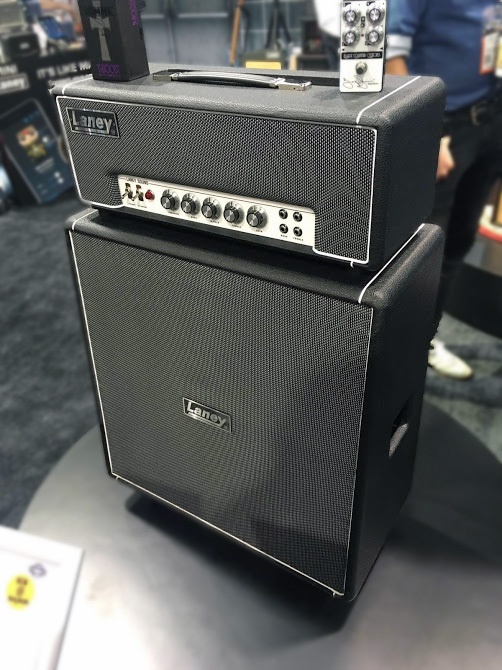 You can get this amp as just a head for around $1200 or a with a 4×12 cab for around $2,000. I think this head would look pretty nice sitting atop the Orange PPC212 vertical cabinet. Not that the matching LA412 wont get the job done, I’m just in the game for smaller rigs these days, but like anyone else, I don’t want to sacrifice an iota of tone. This amp has the thick, rich and just all-around powerful Iommi tone when you push it to the max, but you can still get in that range without running the dB level near that of a jet take-off. You’ll see a sharp drop off in the amount of times a sound guy gives you the death stare as you sound check or you hear the sound of a broom hitting the ceiling from downstairs as you try and figure out the time signature for that sweet Pallbearer riff. It’s 16/4 by the way, those riffs are just so long. 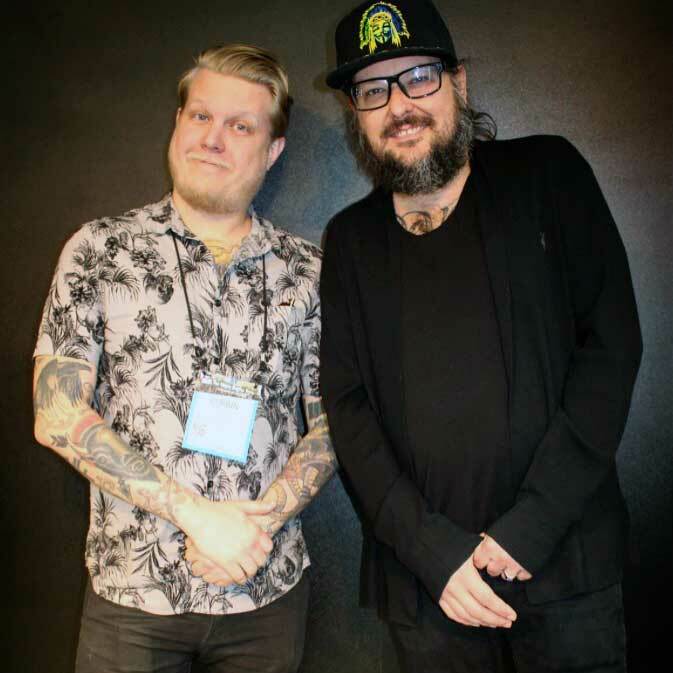 While meeting with some brands, I got a text that in a few hours Jonathan Davis of Korn would be over at the Shure booth. I’ll start by saying that Korn hasn’t come up on my Spotify too often, and when it does, it’s when I’m having a nu-metal nostalgia trip, but back when I was an 11 year old suburban white kid in 1998, Korn was my life. Sure now my tastes may have shifted into more “refined” punk and metal acts but odds are if you follow the next patched up, bearded, long-haired and grizzled doom metal warrior home to his parents’ house, a few Korn CDs are buried in the den. We all started somewhere. When I got to the booth I was late and caught the end of Jonathan doing the signing and photo op. While I had another meeting in a few minutes, the line was only a few people deep so I went for it. Mostly it was just a few words and then a quick photo, but it’s still pretty great to meet someone who created the music that meant so much to you at a very developing part of you life. 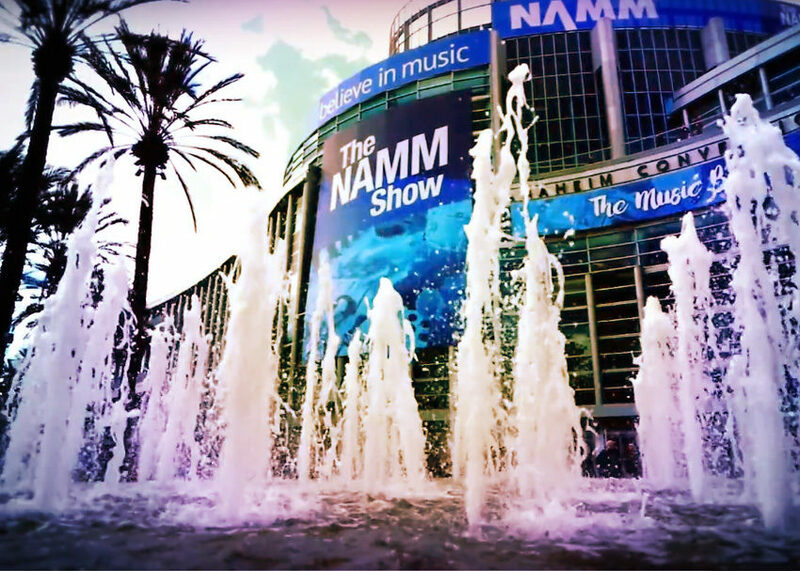 It also speaks to the fact that while NAMM is a giant trade show filled with “business happenings,” most of the people there are just fellow musicians in one way or another and they just want to hang out, and meet the people they respect. You never know what musician or band you’ll see at NAMM, cuz even those guys just wanna check out some cool gear like everyone else. Home studio musicians, take note: Universal Audio has distilled the best of its Apollo Twin MkII desktop audio interface into an even smaller, more affordable, and eminently musician-friendly model: the Universal Audio Arrow. The Arrow has one UAD-2 DSP chip, which opens the door to Universal Audio’s vast collection of UAD Powered plug-ins. UA gets you started with the included Realtime Analog Classics bundle, which includes emulations of the Teletronix LA-2A and 1176LN compressors, Pultec EQs, and the Unison-enabled UA 610-B tube preamp. You can purchase a plethora of additional plug-ins (think amp models, reverbs, and all the outboard gear you can imagine) on Universal Audio’s website. 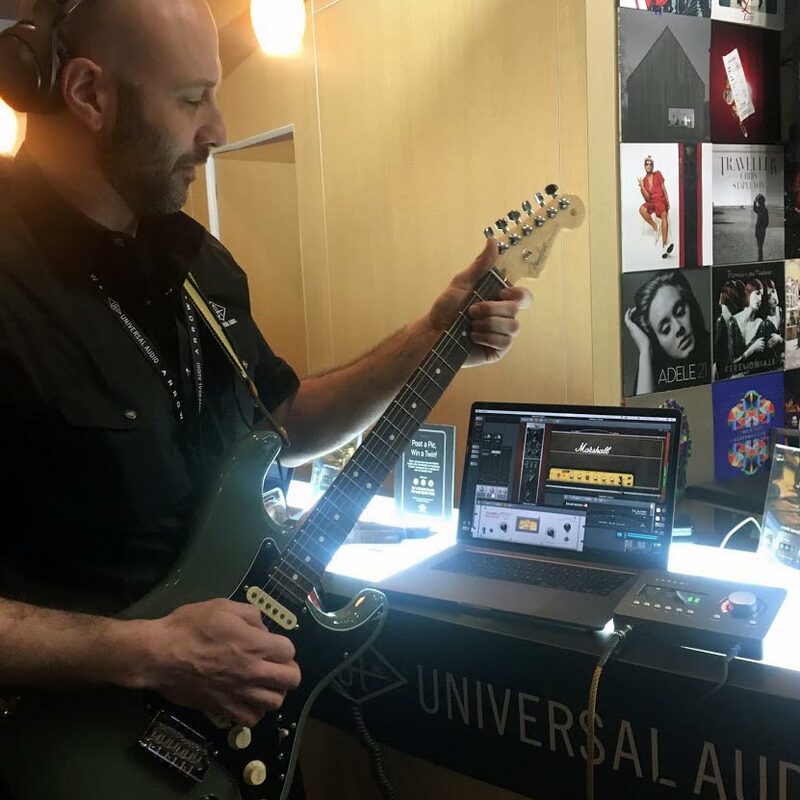 And if you find yourself running a lot of plugs simultaneously and need more processing power, you can always add one or more Universal Audio DSP accelerators to your setup. The Arrow is simply your most affordable point of entry into the world of Universal Audio’s industry-leading analog emulation plug-ins. The Universal Audio Arrow gives you two Unison mic preamps (yep, the same exact mic pres as the Twin) — and a Hi-Z 1/4″ input on the front for plugging in your guitar and bass (yep, just like the Twin has.) Unlike the Twin, the Arrow lacks a digital audio input and 3rd and 4th line outputs. If you don’t need all that I/O, then we strongly recommend the new Arrow as your portable audio interface! One important note: the UA Arrow is a Thunderbolt 3 interface, and it’ll only work if you have a Thunderbolt 3 port on your computer. It’s not backwards-compatible with earlier versions of Thunderbolt, and you’ll need to bring your own Thunderbolt 3 cable to connect your Arrow to your computer. The good news: the Universal Audio Arrow is completely bus-powered! No need for a power adapter. Let’s get one thing straight, I’m a Marshall fan through and through, and have been playing a Marshall for over 15 years. I absolutely love the sounds old Marshalls produce, specifically their pronounced midrange voice and wide dynamic range. This is why as soon as I got to hear the brand new Origin series at NAMM, I immediately fell in love. Available as both combos and heads, the Origin series is Marshall’s tip of the hat to their own models from yesteryear, featuring what are essentially single-channel amps with the addition of a footswitchable gain boost that’ll push you right over the edge whenever you need it. All models of the Origin series feature Marshall’s brand new Powerstem power attenuating technology, allowing you to switch down to lower wattages for that familiar overdrive at very reasonable volumes. 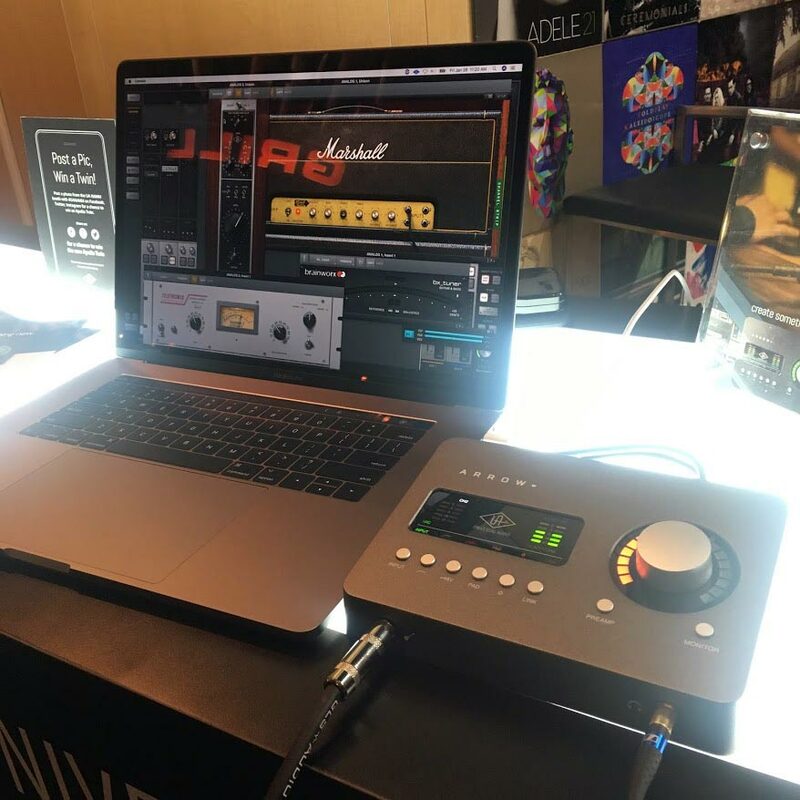 Even when we were at NAMM, the demo guy told me he was only running at 1/2 watt, despite the sound filling the entire room with glorious saturation. One of the coolest features found on the Origin amps is the addition of a Tilt knob. We all know that on old Marshall Plexis, you can use the bright or normal inputs, or jumper the channels to get a blend via each channel’s volume knob. The Tilt control recreates this effect by blending your sound to a bright treble or darker normal sound with the twist of a single knob. 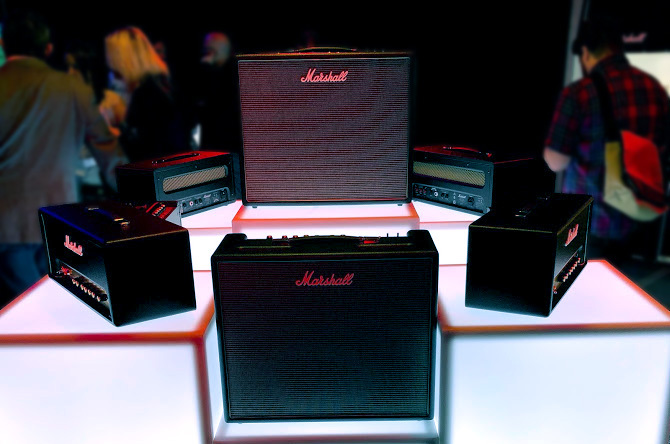 Overall, these amps were quite impressive. I honestly can’t wait to get my hands on one. An Orange PPC212V with a Rocker 15 Terror head on top. One thing I noticed at NAMM 2018 is that much like last year, it’s the age of the low-wattage amps. Maybe it’s just because I rolled over to 30 and am starting to really feel it, but lower wattage amps are really what I want. Don’t get me wrong, there is nothing like standing in front of a 100-watt head roaring through a 4×12 pushing a hot riff-filled wind of creamy, tube-saturated tone, but that’s a lot of volume, and a lot of weight to haul around. If I had a road crew loading my gear it would be one thing, but I’m tired of hauling a closed back 4×12 and a vintage Marshall head with transformers made of what feels like dark matter, up two flights of stairs to play a bar with 30 people in it. 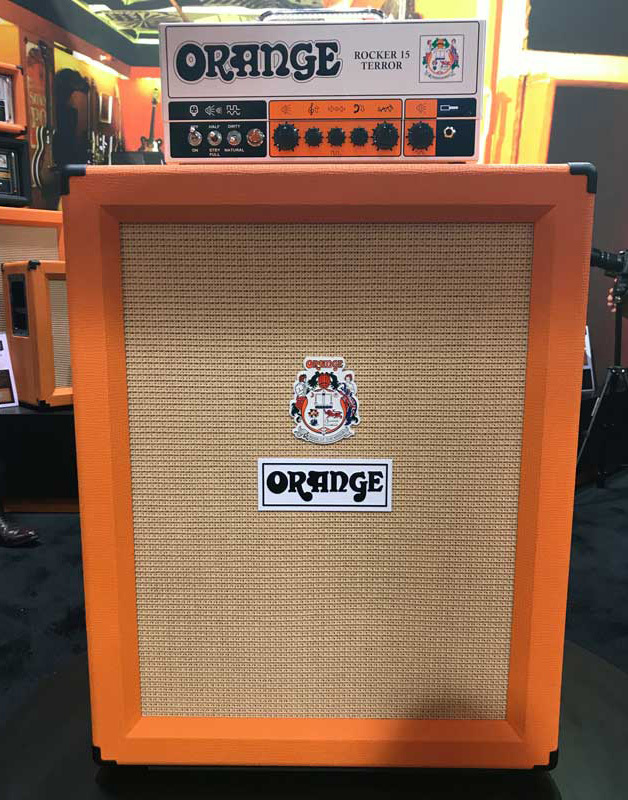 Give me a 30-watt half-sized head and the new Orange 2×12 vertical cabinet. The curse of NAMM is you’re basically in the world’s largest music store so in the cacophony of 1000 guys slapping bass and doing tap solos you can never truly hear anything, but I got a taste of this cab, and adding that with the fact that every single Orange cab I have ever heard sounds beautiful, I am wiling to give Orange the benefit of the doubt on this one. well-mannered apartment rig. In its vertical layout, at first glance it appears more imposing than it really is. When it comes to music gear, tone is half the battle, but looks are the other half, and something as simple as changing from a horizontal to a vertical 2×12 just looks so much more powerful. Waiting anxiously for you to post the presale of the Elektron digitone. I notice every major online store has it besides you and AMS. As soon as you post it I am buying it. The Elektron Digitone is coming very soon! We’ll reply to this comment as soon as it’s available to order on zZounds. For now, here’s a photo we grabbed of the Digitone at Elektron’s NAMM booth. Someone I talked to on the phone at zzounds said you would be posting it this week. Confirmed? That link no longer exists. Is there a new one? My mistake James, I think our comment formatting changed the double hyphen in the link to a single one which is probably why it was broken. 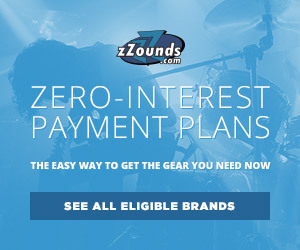 You can find it on zZounds here. I’m glad you were able to find it. Hope you enjoy your Digitone! Boss had a very neat pedal I think it is the GT1000. And the Morley bad horsie mini looked awesome. Charvel stepped up their game with a satchel of steel panther signature guitar. And a 24 fret guitar.